April 3, 2019 April 2, 2019 by Robert Ortiz-Abreu, Jr. The intent of the AGCRA Writing Contest is to give junior members of the Army HR Community a bigger voice in how the AG Corps enables Commanders, supports Soldiers and their Families, and / or executes HR, Army Music, and Recruiting & Retention operations. AG Soldiers, Army HR Professionals, Band, and Recruiting & Retention personnel, are all encouraged to submit web articles every other month related to their respective fields of endeavor within the AG Corps. Winners will be determined and prizes given for the best web articles. Submission of web articles will support keeping AGCRA.com with new and pertinent AG Corps information that will benefit AGCRA members and the Army HR Community. The memorandum of instruction (MOI) for the AGCRA Writing Contest is provided at the following link: AGCRA Writing Contest MOI. Please follow the guidance within the MOI or your article could be returned for noncompliance. Send web articles and any accompanying support files via e-mail to Adjutant@agcra.com. Articles are due for the next contest by 25 April 2019. Writing contests will “normally” be held every other month and announced on AGCRA.com. 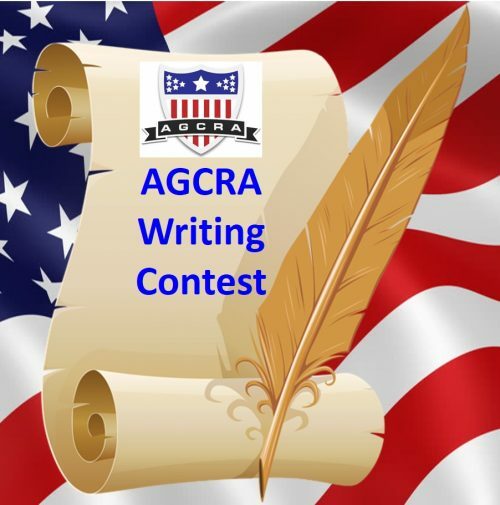 You can always search for the keyword “AGCRA Writing Contest” at AGCRA.com for the most updated information and contest suspense date. Company Grade Officers / Warrant Officers (2LT – CPT and WO1 – CW2). Junior Enlisted (PVT – SSG). Junior Civilian Employees (GS-09 and below, or equivalent civilian employee grades). Preferred topics for this AGCRA Writing Contest edition are provided below. • Does Army HR doctrine and organizational structure support Casualty Operations during LSCO? If not, what needs to change and why? • Are current policies and procedures sufficient to effectively enable Casualty Operations during LSCO? If not, what needs to change and why? • Is the Army HR Community and the Army prepared for mass casualties on the battlefield? If not, what gaps exist and how do we mitigate them? • What strategic task should the HR enterprise be planning for during the strategic roles of shape and prevent in regards to casualty operations? – What postal positions need to be coded with ASI F4/F5? Explain why. – What is the role of CLTs co-located with Mortuary Affairs units? – What tactics, techniques, and procedures (TTPs) proved valuable in maintaining accurate personnel accountability, especially as units were on the move? • How did your S1 section integrate itself into operational planning and remain synchronized with ongoing and future operations? • Where does Army Human Resources Doctrine fall short? How can we fix it? • How does your S1 / G1 / HR Section make itself invaluable to the command? The Pony Express Chapter Rides Again! 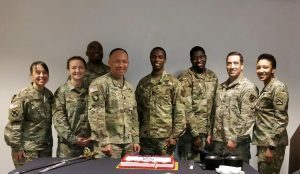 March 29, 2019 March 29, 2019 by Robert Ortiz-Abreu, Jr.
On March 21, 2019, The Pony Express Chapter of the Adjutant General’s Corps Regimental Association (AGCRA) re-activated in a ceremony at the Frontier Conference Center, Fort Leavenworth, Kansas. The ceremony served as the official recognition of the re-activation of the Pony Express Chapter, originally founded in 1993. Conducting the Pony Express Chapter reactivation cake cutting ceremony are CSM Jon Williams, Fort Leavenworth Garrison CSM; PFC Joseph Akpakip, 15th Military Police Brigade / Pony Express Chapter Secretary; and COL Angel Liberg, Assistant Chief of Staff Army Reserve Affairs, Combined Arms Center (CAC) / Pony Express Chapter Vice President. Members of the Pony Express Chapter represent various groups at Fort Leavenworth to include the 15th Military Police Brigade, Command and General Staff College (CGSC), Combined Arms Center (CAC), Mission Command Training Program (MCTP), and the Kansas City MEPS. The Pony Express Chapter aims to provide a platform for the mutual exchange of ideas, while promoting esprit de corps for all human resources affiliated individuals in the Leavenworth, KS area. 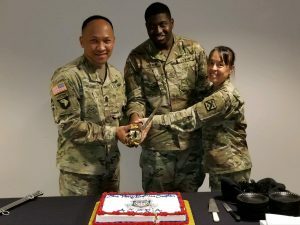 The Chapter also facilitates professional development within the Army Human Resources Community, and leverages partnerships with local businesses through community service and educational opportunities. The Pony Express Chapter Executive Council welcomes all Leavenworth, KS area human resources professionals to join their initiative to promote camaraderie within the Adjutant General’s Corps and the Army’s Human Resources Community. For more information, contact the Pony Express Chapter at AGCRA.PonyExpress@gmail.com. Group photo of the members of the Pony Express Chapter at the Chapter’s reactivation ceremony on 21 March 2019. 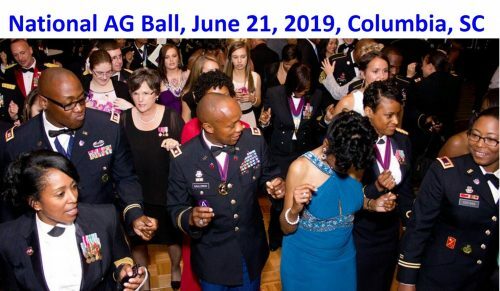 April 1, 2019 March 28, 2019 by Robert Ortiz-Abreu, Jr.
Tickets for the 2019 National AG Ball, hosted by AGCRA, at the Columbia Metropolitan Convention Center, Columbia, SC, are now open to the general public. Please click on the link below to purchase your Ball tickets. As we are anticipating another sold out event, please purchase your tickets early.